Perhaps the “Punk” of the feline world, the American Wirehair is a most distinct, and still quite uncommon, cat. The fur is unusual in that each of the guard hairs – the long, thick hairs of a cat’s coat which are raised when the fur “stands on end” - is crimped along its length and hooked at the end. The fur is therefore frizzy and wirey, and to the touch is not unlike the wool on a lamb’s back. There are records of similar cats being sighted on London bomb sites after the end of World War II, but the cat as we know it today is descended from a Shorthair queen living in the state of New York, who, in 1966, gave birth to a remarkable mutant red-and-white male that had a wavy coat. The kitten was subsequently used to develop the breed, which is still rare outside the IS – although a few American Wirehairs have recently been exported to Canada and Germany, where new breeding lines are now being established. The American Wirehair takes a keen interest in its surroundings, and is considered to have an even-tempered and affectionate nature. All the colours and coat patterns of the American Shorthair are recognized for the Wirehair. 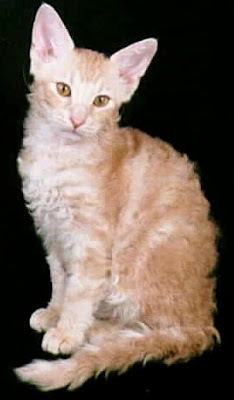 Outcrosses to American Shorthairs have produced a large array of Wirehair varieties, of which the Patched Tabby is one of the more unusual. Such matings generally produce litters of fifty percent Wirehairs. Medium to large in size, and well muscled. The fur is of medium length, and should be tightly crimped, thick, springy, resilient, and coarse. The colour should be brown with black markings and patches of red and/or cream. - Fur on chest and stomach is less coarse. Medium in length, in proportion to the body, and well muscled. The paws are oval and compact; the colour of the pads should harmonize with that of the coat. Round in shape, with a well-developed muzzle and chin. The nose is of medium-length; the colour of the pad should harmonize with that of the coat. Whiskers are crimped and prominent cheek bones. Large and round, set well apart, with a slight upward tilt at the outer edge. The color should be brilliant gold. - Medium in size and round-tipped. - Ears are set well apart. Brown Patched Tabby American Wirehair. The Wirehair’s springy coat creates the illusion that the tabby markings are somehow “ridged” or raised. The combination of tabby markings with pure white is always attractive, and kittens are usually much in demand. White, with black and red patches.